Beryl is a class of gemstones that have the chemical formula Be3Al2(SiO3)6 - beryllium aluminium cyclosilicate. Some important and famous gemstone varieties are types of beryl. Beryls are typically hard (hardness 7.5-8 on the Mohs scale) and often suited to the fabrication of cut gems. 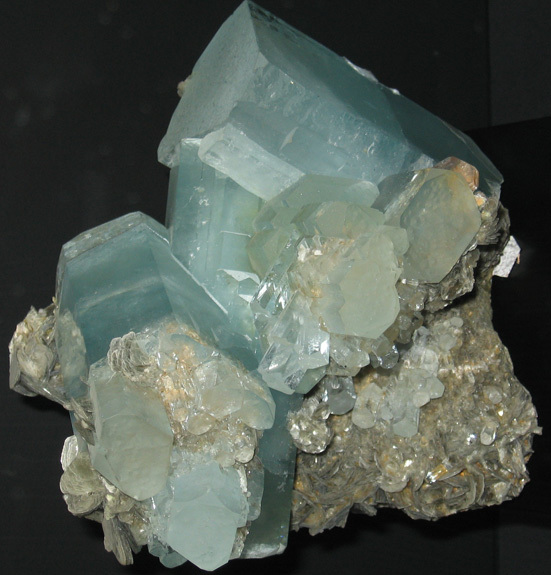 Beryl is a cyclosilicate and beryl stones can often occur in the attractive form of hexagonal prisms. Aquamarine (pale Blue/turquoise) - colored by iron (Fe2+) impurities. Is sometimes heat treated to enhance the color. Sometimes known simply as "aqua". Emerald - emerald green, of course! The most valuable beryl. Green color comes from chromium impurities. Emerald is more prone to flaws than other beryl varieties and large flawless stones are rare. Golden beryl (yellow-gold, sometimes categorized together with Heliodor) - colored by iron (Fe3+) impurities. Goshenite - "pure" beryl, colorless - no mineral impurities. Relatively inexpensive and not typically used as a gemstone. It has on occasion been found fraudulently backed with green foil in a sly attempt to pass it off as high-grade emerald, which, also being a beryl, has many of the same physical properties. Heliodor (greenish yellow) - iron, sometimes uranium (less common.) Darker colored stones are more valuable. Morganite (aka pink beryl, pink emerald, rose beryl) - colored pink by manganese impurities. Named after J.P. Morgan, banker and mineral collector. 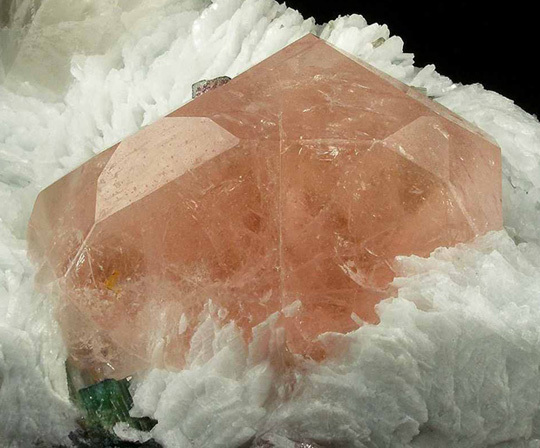 Morganite also contains caesium and lithium, but these are not believed to be responsible for its coloration. Morganite is generally one of the more costly beryls; though not as expensive as emerald. The color of morganite fades after prolonged exposure to sunlight, thus rendering fine, intensely colored stones more rare. Although sometimes found flawless, morganite often contains minor inclusions. Morganites may have been treated with oil in order to mask flaws - and such treatments should be declared by sellers. Peach Beryl or Champagne Beryl - an orange-pink variety of morganite beryl. Beryl -Be3Al2(SiO3)6 - as described above. Pezzottaite - a rare, recently discovered "raspberry red to pink" beryl group mineral conaining cesium and lithium. Pezzottaite has the chemical formula Cs(Be2Li)Al2(Si6O18). Bazzite - Be3Sc2Si6O18 - Deep blue or blue-green in color; the coloration being caused by scandium. Rare. Stoppaniite - Be3Fe2Si6O18 - extremely rare, not yet found at gem quality (? ).